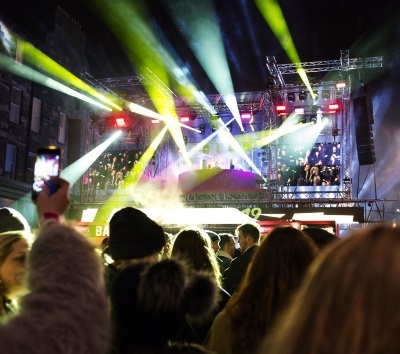 Catalyst Event Production supports new year celebrations in Scotland for 60,000+ people with more than 200 d&b loudspeakers. Edinburgh’s Castle and medieval Old Town offered a magnificent backdrop to Edinburgh’s Hogmanay celebration for thousands of revelers who welcomed the new year immersed in a city center-wide d&b installation. In collaboration with sound designer Dan Jones, Catalyst Event Production Services were tasked with specifying, installing and operating a sound solution that would envelope the partygoers, leading them to a complete d&b audiotechnik loudspeaker, amplification and R1 control software solution. The world-famous Street Party showcased Scottish and European musicians, street theatre artists, dancers, choirs and aerialists, while the midnight firework display was set to a specially-commissioned track by German band Meute. The team covered the four designated party areas of the city with PA towers spaced at 20m intervals. In total, twenty two towers were built, each carrying arrays of d&b loudspeakers consisting of two Y8, one Y12 and a Y-SUB, along with two Y10P for near fill. There were further systems deployed on ‘The Mound’ where six towers were erected. Each tower consisted of arrays of three T10, one Q-SUB and two T10 near fill. An additional system made up of eight Y8 and two Y-SUBs provided further fill coverage. Amplification was provided by twenty four D80, thirteen D20 and four D12s. With the addition of PA for safety announcements, the installation used a total of two hundred and eleven d&b cabinets, utilizing d&b Y, T, Q, and C series. 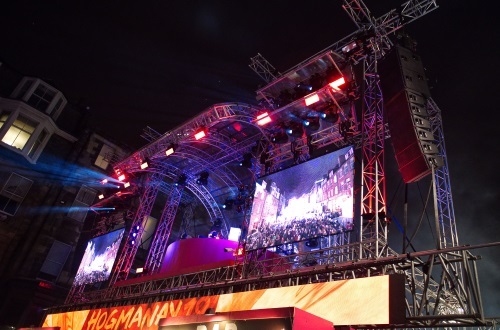 The system was designed to give a 3D experience along the street, immersing party-goers in the soundtrack of the night – including the specially commissioned 5.1 surround track for the midnight moment. Catalyst also provided PA for two of the larger stages utilizing V and J-Series cabinets. Catalyst has worked with Underbelly for more than a decade now, under the account management of director Ronnie MacLennan. Catalyst’s Technical Project Manager, Mike Wright, continues: “Our brief was to provide support for the client’s wish to create an immersive experience on the street. Physical barriers, such as buildings and trams, made creating true ‘surround sound’ difficult, so we needed a clever solution. The complexity of the system required the routing of forty six discrete mixes from front of house as well as twenty channels of zoned safety announcements. The safety channels utilized the override function of the amplifiers, allowing Event Control to make crowd safety and general announcements when necessary. All systems were designed using d&b ArrayCalc and managed using the d&b R1 Remote control software, giving complete control and monitoring of all amplifiers where network was present. Project manager Andy Kidd and systems tech Sam O’Neill built the R1 file for the Hogmanay events in-house, with assistance from Oran Burns from the d&b GB Education and Application Support Team. Wright continues: “This year, our R1 file controlled a total of thirty five amplifiers along 1.4km of street. Signal is distributed on a Riedel MediorNet fibre system, utilizing more than 10km of fiber supplied by Underbelly. We used Riedel RockNet for local distribution and over 1.5km of Socapex cabling. “A tablet was used via a remote desktop app and 4G to allow system tweaks to take place on the street, as sites were up to 1.5 km from the control area. The flexibility of the d&b loudspeakers across the range allowed us to choose the right cabinets for the job, whilst utilizing our own rental stock to the maximum.